How is this possible with all the unresolved problems of high burnup fuel? How is this possible when the NRC will not approve transportation containers for high burnup fuel due to the risk of shattering of the fragile protective fuel cladding that can even lead to a hydrogen explosion? The NRC should be required to issue an updated report to address the high burnup transport issues. CHAIRMAN MACFARLANE: Okay, good. And did the study address – did it look at transporting and the risks of transporting high burn-up fuel which after long term storage may become embrittled? MICHAEL RYAN: Yes. It was a wide range of fuels, fuel types, fuel burn-ups that were evaluated. MICHAEL RYAN: All of that, yes. CHAIRMAN MACFARLANE: Okay, good. All right. That’s what I was interested in. The report actually excludes high burnup spent fuel from evaluation. After making excuses for why they did this, the report makes unsubstantiated assumptions about high burnup spent fuel transport and ignores NRC’s own documents and policy on the transport of high burnup fuel. The regulatory external dose rates must still be met, so there is no effect on incident-free transport or on the results from accidents that do not result in cask damage. 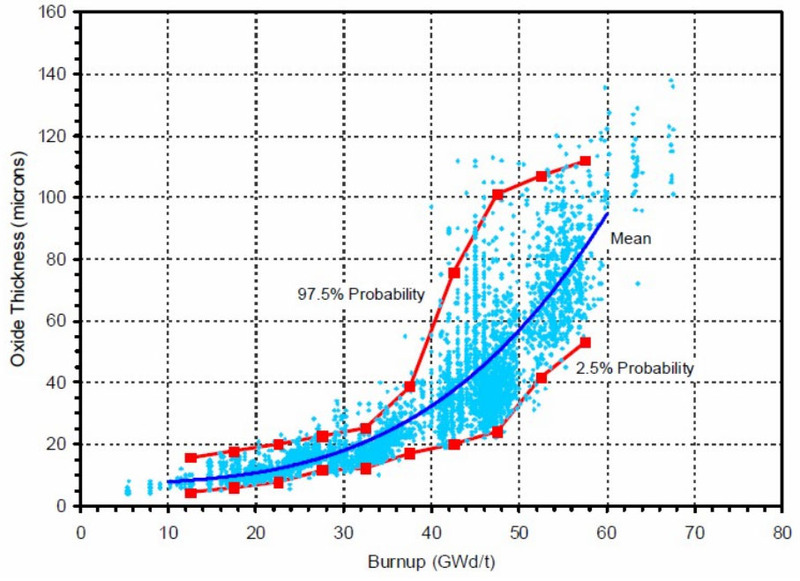 The higher burnup fuel will have to be cooled longer before it is transported to meet the cask’s decay heat and dose rate limits and the expected radiation emanating from the fuel should not change substantially (it cannot increase above the regulatory surface dose rates, and the casks studied here are either at that limit or very near to it). Therefore, results from loss of shielding accidents will not change significantly. In all of the accidents that are severe enough to have a release path from the cask, the acceleration level is high enough to fail the cladding of all of the fuel, whether it is high burnup or not. Higher burnup fuel has a rim layer with a higher concentration of radionuclides. This will lead to the rod-to-cask release fraction being higher but will not affect the cask-to-environment release fraction (Table 5-10 gives the release fractions used in this study.). In addition, the isotopic mixture of the higher burnup fuel cooled for a longer period of time will have more transuranic isotopes and less fission product. For example, the inventory of 241Am (Americium-241) goes up from 193 Tetrabecquerels (TBq) at 45 GWD burnup to 1,980 TBq at 60 GWD burnup (5,210 curies (Ci) to 53,400 Ci) and the inventory of 90Sr (strontium-90) drops from 40,400 TBq to 30,600 TBq (1,090,000 Ci to 826,000 Ci). Insufficient data exists to accurately estimate the rod-to-cask release fractions for higher burnup fuel. If the release fractions remain the same, the effect of the change in radionuclide inventory increases the number of A2s released by a factor of 5.9. This increase does not alter the conclusions of this study. The NRC findings on transporting nuclear spent fuel contains many assumptions, resulting in unsubstantiated conclusions. Here are their findings and conclusions. The collective doses from routine transportation are very small. Theses doses are about four to five orders of magnitude less than collective background radiation doses. The routes selected for this study adequately represent the routes for SNF transport, and there was relatively little variation in the risks per kilometer over these routes. Radioactive material would not be released in an accident if the fuel is contained in an inner welded canister inside the cask. Only rail casks without inner welded canisters would release radioactive material and only then in exceptionally severe accidents. If there were an accident during a spent fuel shipment, there is only about a one-in-a-billion chance that the accident would result in a release of radioactive material. If there were a release of radioactive material in a spent fuel shipment accident, the dose to the MEI would be less than 2 Sv (200 rem) and would not result in an acute lethality. The collective dose risks for the two types of extra-regulatory accident (accidents involving a release of radioactive material and loss of lead shielding accidents) are negligible compared to the risk from a no-release, no-loss of shielding accident. The risk of loss of lead shielding from a fire is negligible. None of the fire accidents investigated in this study resulted in a release of radioactive material. Based on these findings, this study reconfirms that radiological impacts from spent fuel transportation conducted in compliance with NRC regulations are low. They are, in fact, generally less than previous, already low, estimates. Accordingly, with respect to spent fuel transportation, this study reconfirms the previous NRC conclusion that regulations for transportation of radioactive material are adequate to protect the public against unreasonable risk. The NRC should be required to complete a revised report considering the implications of high burnup fuel transport. The majority of the fuel in U.S. spent fuel pools is high burnup fuel and over 200 dry casks contain high burnup fuel. The first high burnup fuel was loaded in 2003 at Maine Yankee. Maine Yankee loaded their high burnup fuel assemblies in “damaged fuel cans” as a safety precaution. However, they may be the only nuclear plant that has done this. 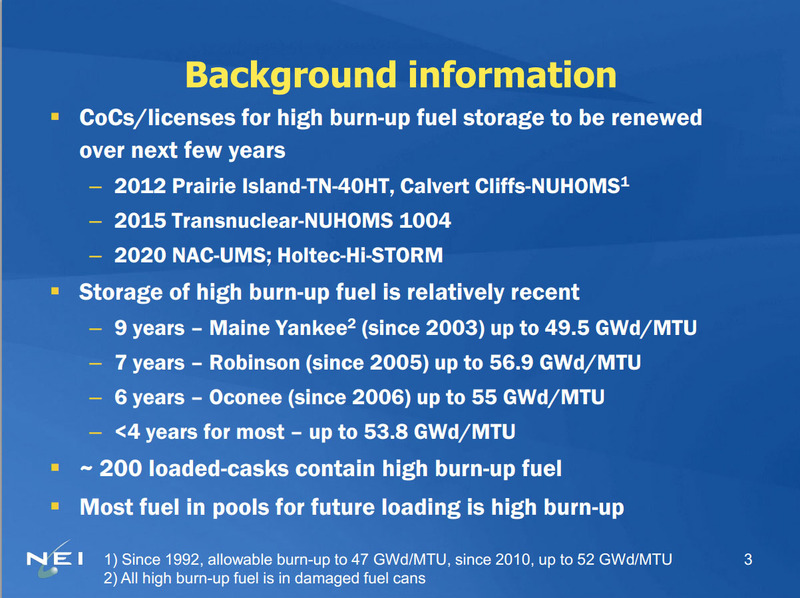 The NRC will not renew current high burnup 20-year dry cask licenses, due to the instability and unpredictability of high burnup fuel. This entry was posted in NRC, Nuclear Waste and tagged high burnup, Macfarlane, NRC, nrc commissioners, nuclear waste, NUREG-2125, transportation. Bookmark the permalink.